Have knowledge, skill, confidence to manage health and health care In any population group, some people will be at the low, middle, and high end of this dimension. 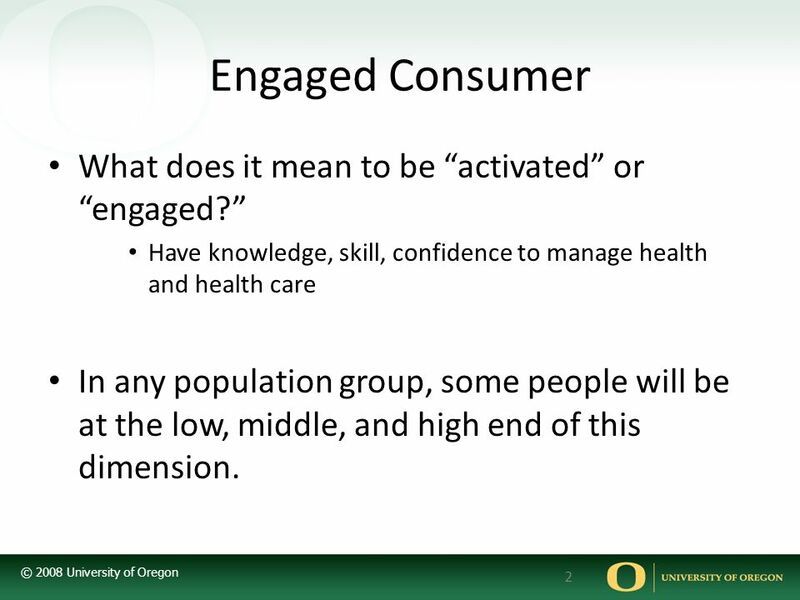 What does it really mean to be an activated engaged consumer and how to we make that happen in large population groups and within individuals? 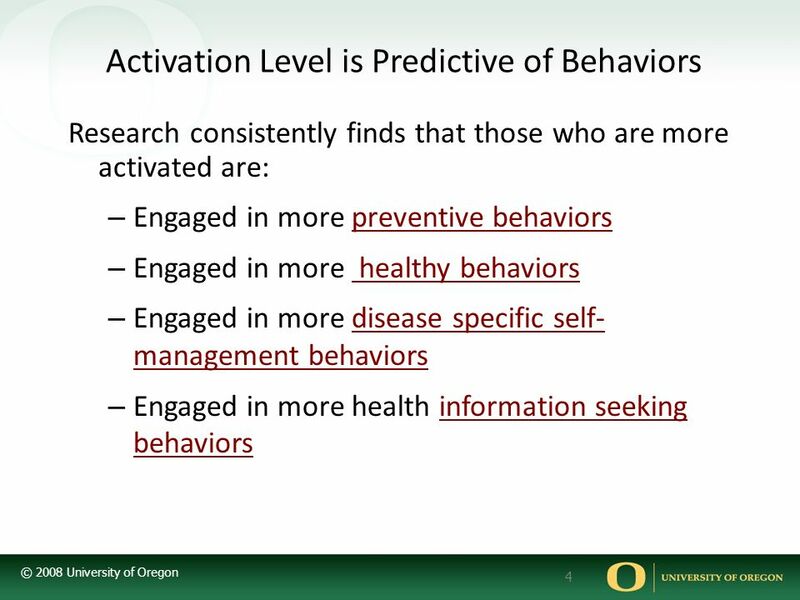 Many of the behaviors we are asking of people are only done by those in highest level of activation Persistence in asking – when don’t understand--in medical encounter Effectively use high deductible health plans Knowing about treatment guidelines Using quality information/ knowing where to find it When we focus on the more complex and difficult behaviors– we may discourage the least activated Start with behaviors more feasible for consumers to take on, increases individual’s opportunity to experience success. Help consumers by breaking behaviors down into smaller steps By not really knowing where people are– we are in effect throwing non-swimmers into the deep end of the pool and hoping for the best. What about people who are not activated, are we just discouraging them further? 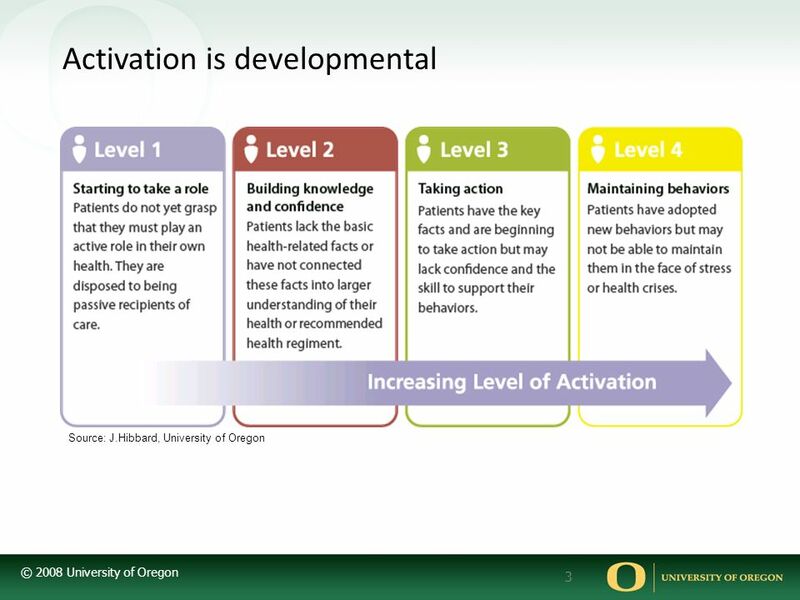 start with behaviors that are feasible– whether the clinical encounter– telephonic coaching– employer communications– -- the idea is to help or People gain a sense of competency: Experiencing success Physician support is important Encouragement Seeing others like them succeed. 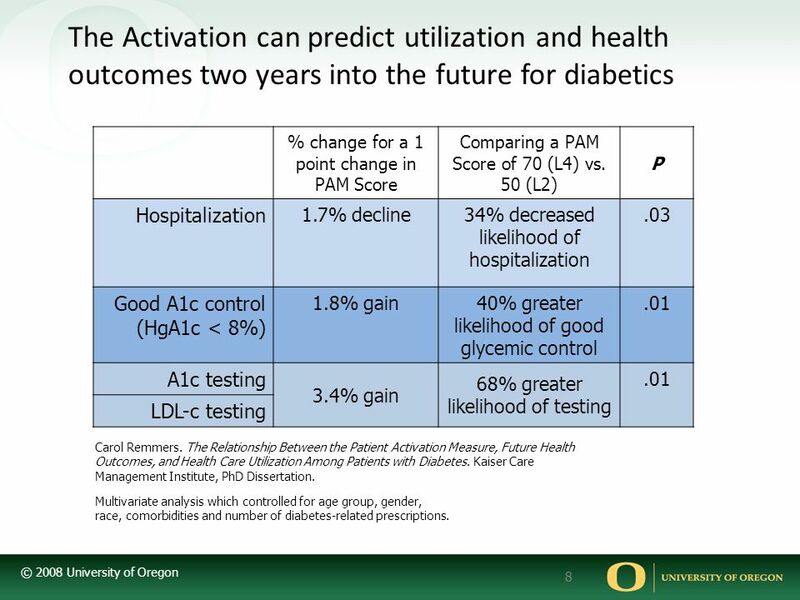 % change for a 1 point change in PAM Score Comparing a PAM Score of 70 (L4) vs. 50 (L2) P Hospitalization 1.7% decline 34% decreased likelihood of hospitalization .03 Good A1c control (HgA1c < 8%) 1.8% gain 40% greater likelihood of good glycemic control .01 A1c testing 3.4% gain 68% greater likelihood of testing LDL-c testing Robust measurement that predicts important outcomes… Carol Remmers. 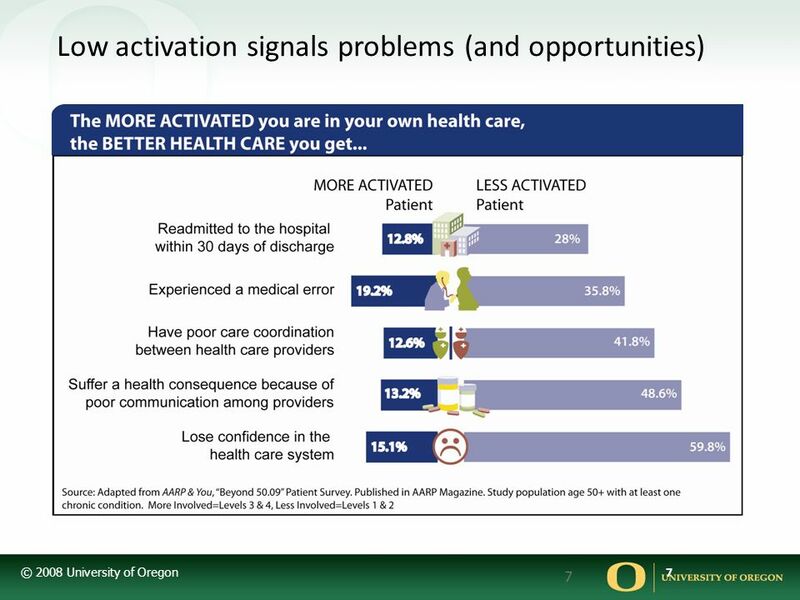 The Relationship Between the Patient Activation Measure, Future Health Outcomes, and Health Care Utilization Among Patients with Diabetes. Kaiser Care Management Institute, PhD Dissertation. Multivariate analysis which controlled for age group, gender, race, comorbidities and number of diabetes-related prescriptions. 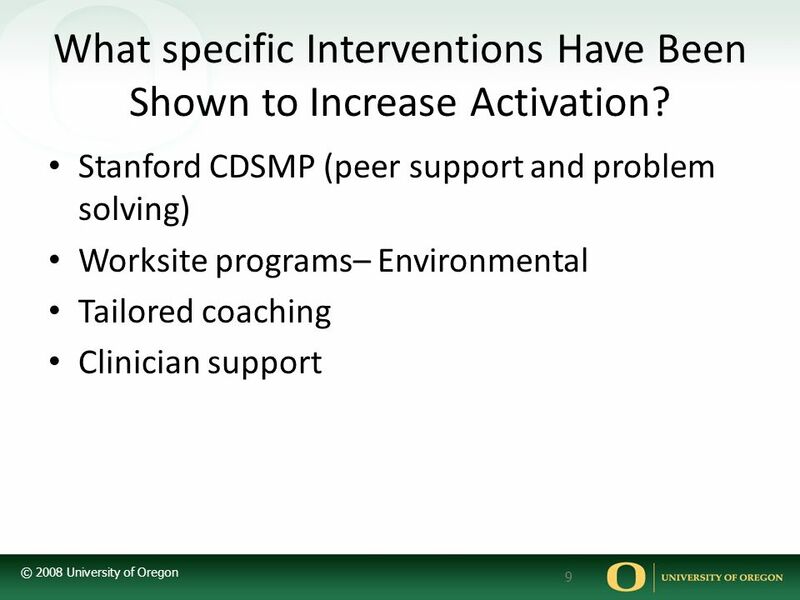 9 What specific Interventions Have Been Shown to Increase Activation? 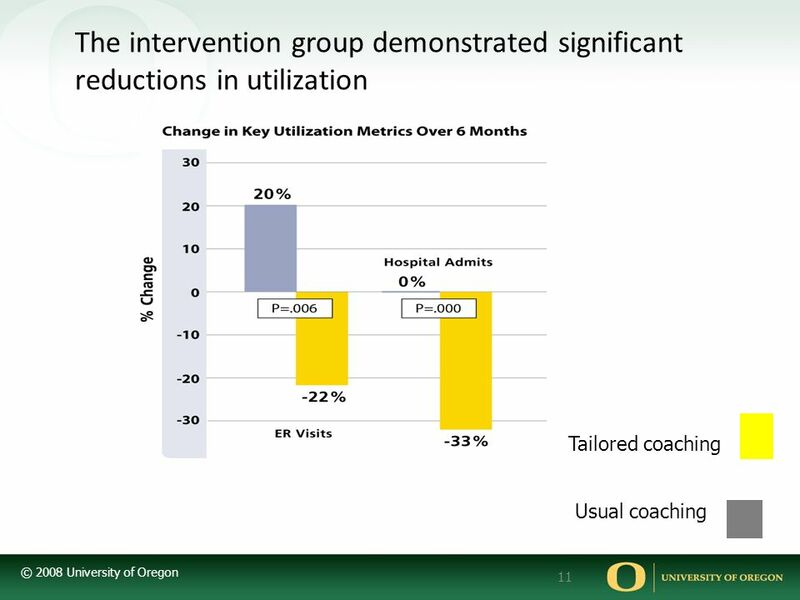 Intervention group coached based on level of activation. 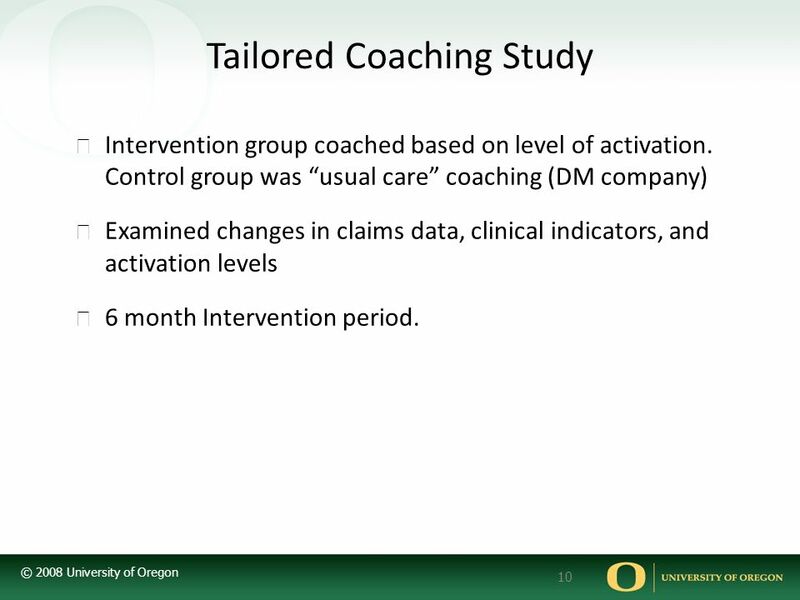 Control group was “usual care” coaching (DM company) Examined changes in claims data, clinical indicators, and activation levels 6 month Intervention period. 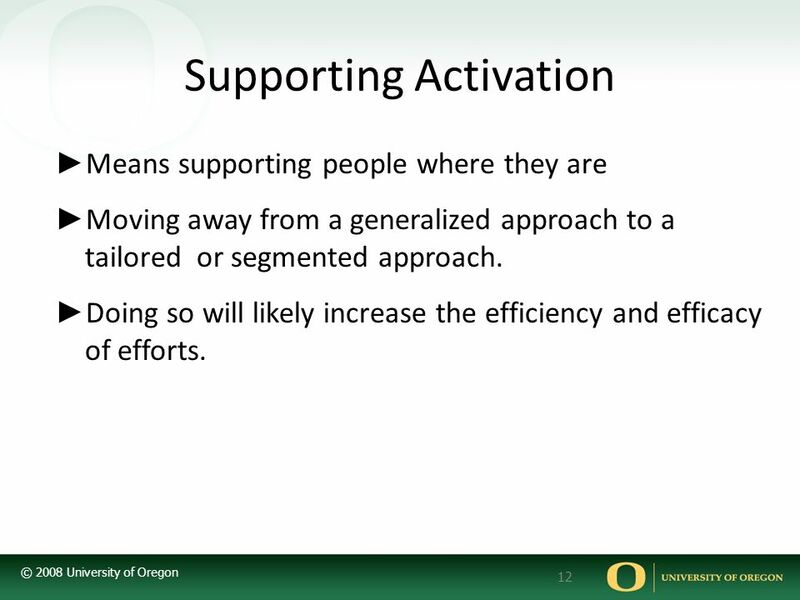 Means supporting people where they are Moving away from a generalized approach to a tailored or segmented approach. Doing so will likely increase the efficiency and efficacy of efforts. 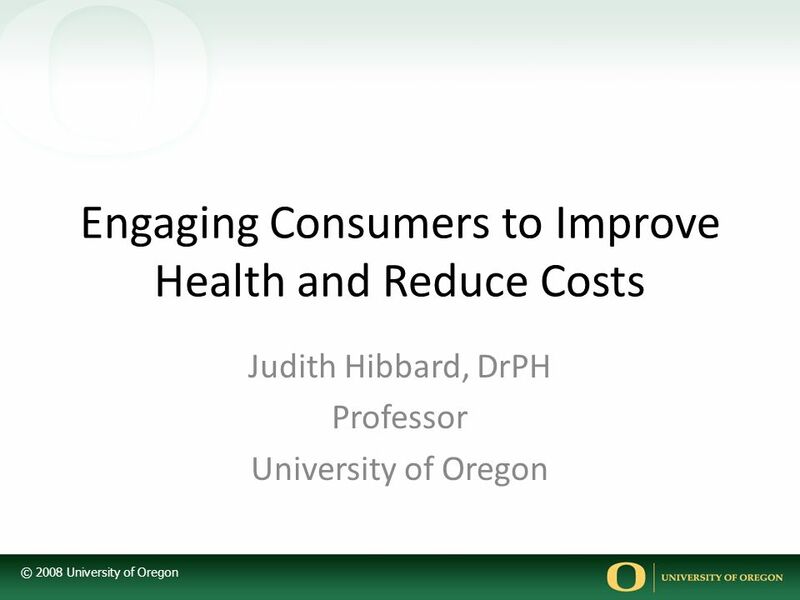 Download ppt "Engaging Consumers to Improve Health and Reduce Costs"
Cost-sharing for Emergency Care and Unfavorable Clinical Events: Findings from the Safety And Financial Ramifications of ED Copayments (SAFE) Study AcademyHealth. Next Steps in Measuring Clinical Quality Joe V. Selby, MD Division of Research Kaiser Permanente Northern California. 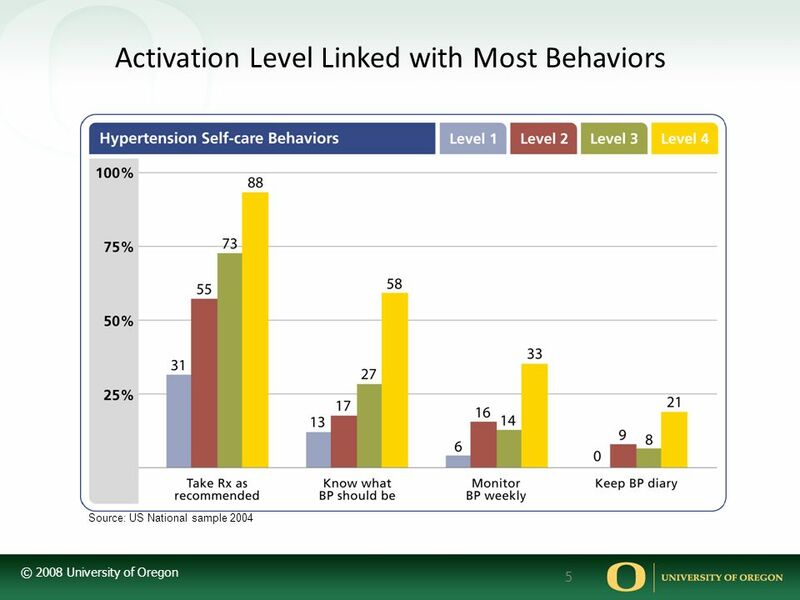 How Older Adults Use the Internet to Look for Health Information Kathryn Flynn Duke University Maureen Smith University of Wisconsin Jeremy Freese University. Chronic disease self management – a systematic review of proactive telephone applications Carly Muller Dean Schillinger Division of General Internal Medicine. December 2005 Presentation to the Vermont Commission on Health Care Reform Kenneth E. Thorpe, Ph.D. Robert W. Woodruff Professor and Chair Department of. Young and Uninsured: Insurance Patterns of Adolescent and Young Adult (AYA) Cancer Survivors 2014 Applied Demography Conference Susanne Schmidt, Helen. Cancer-Focused News Coverage and Information Seeking Jeff Niederdeppe, Dominick Frosch & Robert Hornik Center of Excellence in Cancer Communication Research. SC PA Best Practice Sharing. Practice 1 PDSA’s Included:  Identifying DM patients prior to and/or at time of visits  Identify who needs Urine Micro. EVIDENCE-BASED PRACTICES Family Psychoeducation. What are evidence-based practices? Services for people who have experienced serious psychiatric symptoms. SAFETY NET NETWORK LEADERSHIP AND ADVISORY GROUP MEETING Wednesday, June 19, 2013. 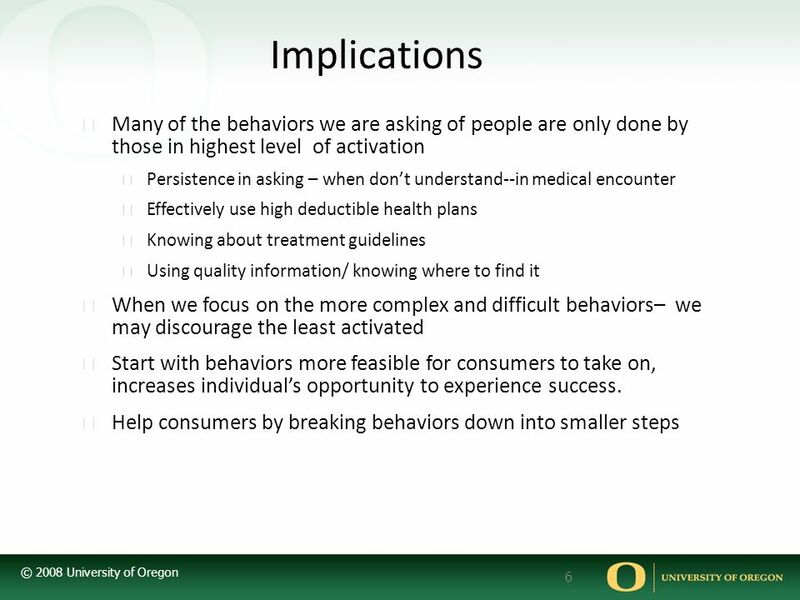 Challenges and Successes Treating Adolescent Substance Use Disorders Janet L. Brody, Ph.D. Center for Family and Adolescent Research (CFAR), Oregon Research.